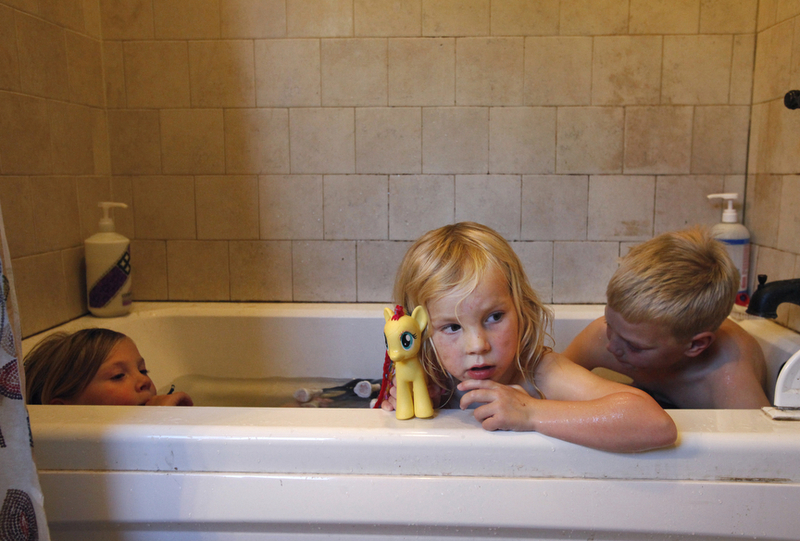 From left, Markegard siblings Quill, 6, Quince, 4, and Larry, 7, take their weekly bath together to save water in their family home Nov. 4, 2014 in Half Moon Bay, Calif. The Markegards started their grass-fed business nine years ago on 1,000 acres of land they’ve leased for years in Half Moon Bay. As the drought worsened this year, they saw their 16 water sources shrink to just one. They’ve had to move their 4-500 head of cattle to land leased off the property because all of the water sources on their land have dried up, including the spring that used to provide water for their home. Now they have to haul in water for their family once about every three weeks. “We watch every drop,” said Doniga about their water conservation.